At this point, I've figured out how to do well at a criterium race (short flat circuit race, fast and technical cornering), but still find myself in a world of hurt and dispair when it comes to road races. It's so easy to start beating myself up mentally when I'm in agony on a climb and feel myself struggling to hang on. It's easy to forget that half of the other guys are probably in the same boat, and just pushing through. And, all pain in temporary. Cycling takes mental fortitude, in addition to physical strength. And, different types of races take different types of mental preparation and strength. Road races take an ability to push through pain for much longer than criterium races, which have become my "comfort zone" of racing. 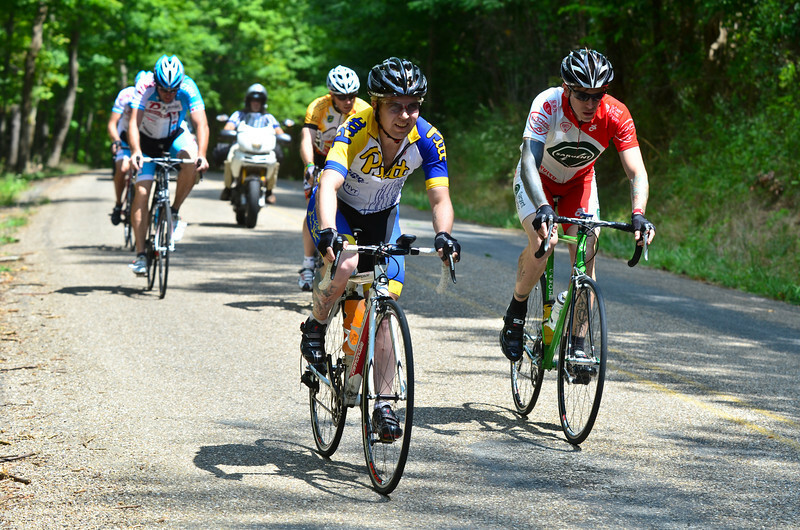 In many ways I think that having a chronic illness has better prepared me to handle the pain of competitive cycling; those of us with IBD know what pain really means. But, in other ways, perhaps this history makes it more difficult to volunteer for a world of hurt, no matter how relatively short a few hours may be. It is both a glorious and terrible feeling to choose to let the pedals stop spinning and make the pain stop before the summit - a choice that we are never given when facing illness or surgery, and one that is soon followed by regret in a race. And, because of Crohns and my relative gutlessness, pushing onwards means that much more to me. I can face whatever agony this race brings, and I will finish it! And, within a few minutes of finishing, none of the suffering will seem so bad. In fact, I'll remember it as a good time. Few things worth doing come easy. And, there is only one way to get better at road racing: do more of it! 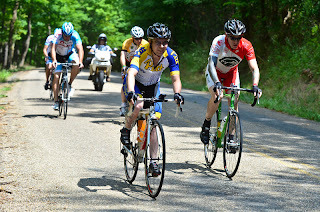 Also, I need to do more climbing more often, as evidenced by my pain on the climbs of this course. This photo is of the first summit, when the pack had already broken up considerably. You can see the USA Cycling official on the motorcycle in the back bringing up the last of the real pack - it is possible to fall behind the scooter, and there are few things more demoralizing. When you hear that engine, you force yourself to pick up the pace! One major success of this race was hydration! I brought 3 bottles with extra concentrated gatorade plus Elete electrolyte add in - 2 in the bottle cages and one in my back pocket - and needed every bit of it. Three bottles might seem a bit excessive for a two hour road race, but with less intestines come impaired hydration. If the race had been longer I would have desperately needed a feedzone handup! Goals for next time: More watts, less weight, and less negative self-talk. That's the magic recipe. No matter where I place in the finish, it is about achieving my personal best, beating the medical odds, and proving that I can still be competitive in this sport despite my added challenges.